While you can start avocados from seeds, they tend not to produce as well as the parent plant and cuttings are difficult to root. This leaves grafting as the best method for propagating avocado trees. Because avocado grafts tend to fail frequently, it is a good idea to create multiple grafts to improve the chances of success. Four techniques, bud grafting, whip grafting, cleft grafting and bark grafting are frequently used to graft avocados. Budding is recommended for grafting avocados, states the Division of Agriculture and Natural Resources at the University of California. In budding, only a bud is grafted to a branch on a root stock tree. Use a sharp knife to remove a bud from new growth on the desired avocado tree. Cut a shield-shaped section under the bud that exposes inner bark around the edges. Make a "T" shaped slit in the bark on a branch of the root stock avocado tree. Lift the edges of the bark and slip the bud under the edges of the slit to hold the bud in place. When the bud starts growing, cut the branch off above the graft. Whip grafting works well for small-diameter root stock grafts. A whip graft uses a root stock and scion that are close to the same diameter. A root stock branch is then cut off cleanly at an angle to expose the inner bark. This acts as a nurse branch to feed the scion. Cut two scion branches with buds. Trim the scion's bottom tip off at a similar angle to the nurse branch. Make a small slit in the ends of the scion and nurse branches. Insert the scion into the nurse branch so the slits wedge together. Seal the graft until it takes. Texas A&M University suggests using a cleft graft on avocados. The cleft graft consists of a larger branch, cut off cleanly and split down the middle. This split will receive two scions. Prepare the scions by cutting two branches with buds from the desired tree. Cut the bottom end of the scion in a wedge shape. Insert each scion into the split in the nurse branch in the root stock tree so that one edge of the exposed inner bark on the scion aligns with the inner bark in the split. There will be one scion on each side of the nurse branch. Seal the graft. When the graft takes, trim the weaker of the two scions off. 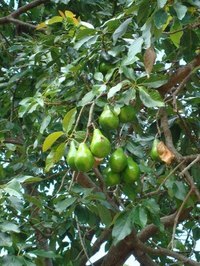 According to the University of California, bark grafting is good for avocado root stock with larger branches. Cut the root stock tree off to two main branches. Cut one off as the nurse branch. Cut multiple vertical slits in the bark at the end to receive the scions. Cut several small branches with buds for scions. Cut the bottom of each scion at a steep angle to expose the inner bark. Lift the bark along each slit in the nurse branch and insert the scion into a slit with the inner bark facing inward. Secure the scions. Once established, trim all but one scion off. Cut the original branch off to encourage scion growth.